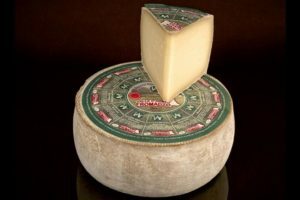 Valle d’Aosta Fromadzo is an Italian semi-hard cow’s milk cheese produced in Valle d’Aosta, and is one of the region’s most beloved specialties. Valle d’Aosta Fromadzo flavour evolves as it matures, it is fragrant and semi-sweet while it is fresh, and it becomes more pronounced and slightly salty with a hint of spiciness as it matures. Valle d’Aosta Fromadzo cheese must be produced within the territory of the Valle d’Aosta region, therefore the milk used to make the cheese gives it a distinctive aroma of mountain herbs. It is traditionally served with polenta and pan-fried vegetables and should be paired with local DOC wines from Aosta, but it also goes very well with Chianti DOCG.